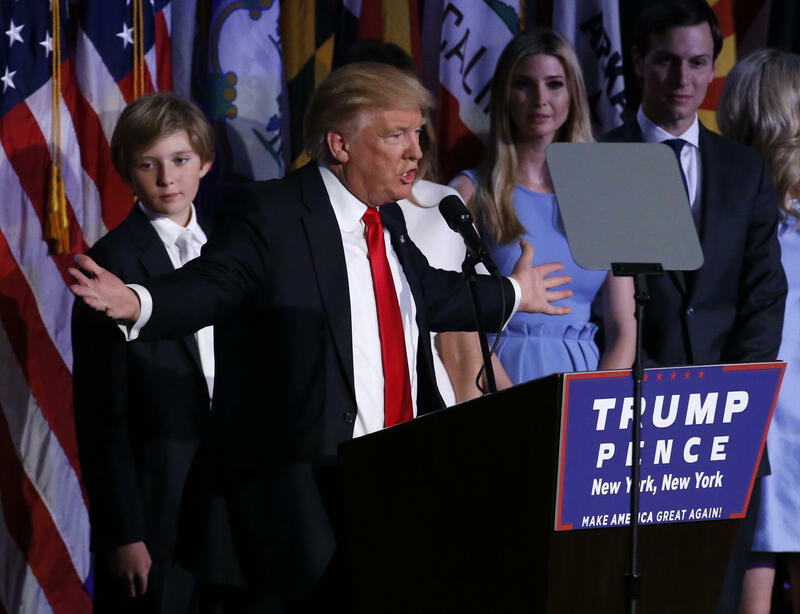 Donald Trump, in a major upset, was elected the 45th president of the United States over Hillary Clinton. He took the stage early Wednesday morning before a raucous crowd of supporters in midtown Manhattan. He praised Clinton for the hard work she’s done for the country, and told the crowd that “we owe her a major debt of gratitude” for her service to our country. It was a remarkably conciliatory speech from a candidate who had employed more fiery rhetoric his campaign and endured few slights silently. “The forgotten men and women of our country will be forgotten no longer,” he promised. Clinton’s concession call came as a surprise to some of her staffers, who first heard of her call from reporters. Indeed, not long before Trump spoke, the Democratic nominee had dispatched her campaign manager, John Podesta to her election watching party at the Javits Center to send her supporters home and wait for more conclusive results. Clinton and her campaign had been confident of victory going into election night, CBS News’ Nancy Cordes reported. All of the data they were looking at told them she would win. And in the early hours Wednesday, Cordes said her campaign was going over the data again, while also looking for any voting irregularities that might have occurred. Trump’s victory was a stunning upset -- the political neophyte, who thought little of data gathering, the ground game or TV ads, ended up carrying several key battleground states, including states Democrats had little to no expectation of losing. The fears of Trump’s down-ballot effect also turned out to be unfounded. The Senate remains in Republican hands, as does the House. Trump’s dominance was also seen during the primary season, when he knocked out 16 other Republican rivals in his party’s primaries earlier this year, with a candidacy built on the slogan of “making America great again” -- a promise predicated on increased isolationism. He has proposed a ban on Muslims from entering the U.S., the building of a wall on the southern border, the tearing up of international trade deals, and the reworking of defense treaties. While garnering only lackluster support for his legislative agenda among top Republican lawmakers, Trump also alienated many for his controversial rhetoric both on the campaign trail. Early in his primary bid, the New York businessman targeted Arizona Sen. John McCain, his party’s former presidential nominee and a Vietnam War veteran, and said he wasn’t a war hero “he was captured” as a prisoner of war. His attacks on his own party elders didn’t end there: Later, Trump lashed out at vocal critic South Carolina Sen. Lindsey Graham by giving away his personal cell phone number at a campaign rally. Trump mocked the disability of a New York Times reporter at a campaign rally after he contested the candidate’s account of New Jersey Muslims celebrating 9/11.After he became the Republican nominee, Trump called House Speaker Paul Ryan a weak and ineffective leader. During the general election, after Khizr Khan, the father of a Muslim soldier who lost his life fighting in the Iraq War, gave a speech at the Democratic convention criticizing Trump, the real estate magnate leveled criticisms at the Gold Star family. And of the women who came forward and accused him of sexually predatory behavior spanning decades, he suggested they were lying -- and also unattractive enough for him to even consider assaulting. Clinton, the strong media and polling favorite to win the election, targeted all those controversies in her campaign against Trump -- to little avail. The Democratic nominee has not yet given a concession speech.